Smile shutters. Blink warnings. Fart detectors. Point and shoot cameras have been stuffed with gimmicks for years, but the arms race isn't ending any time soon. 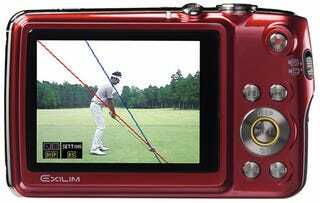 Casio just added golf swing analyzation to their Exilim line. Otherwise, the Casio Exilim EX-FS10 is a typical, 9.1MP camera with perks like 1000fps burst mode, 720P video recording and 3x optical zoom.